Thanks to Ernie & Charlotte Wiens for sharing their peace tax letter with us, below. May it inspire many others to act on the leadings of their conscience. There are many Canadians who simply believe it is wrong to kill another human being for any reason. During World War ll some 10,000 Canadians chose to be conscientious objectors and refused to take up arms in order to kill. Some would say one should be willing to defend one’s country. 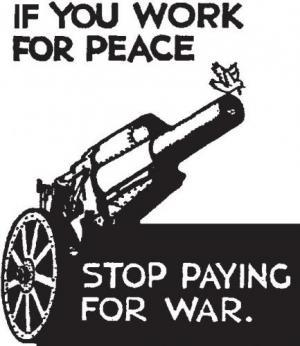 This may sound noble but in reality if you go to war you aim to kill before you are killed.The problem, as you know, is that if everyone operates from this premise you end up with what we have today- militaries in almost every country on the planet, including our own, spending precious human,environmental and financial resources preparing to kill. Particularly abhorrent is the fact that even our own country produces military vehicles and equipment which are sold around the world to help other nations kill in the name of their country. It is not unlikely that these weapons could be used to wreak havoc on the country from which they originate. We long for a leader to speak and to act like this while in office. Mr. Trudeau, you yourself reportedly said that if you were not an MP you would consider participating in Non-Violent Peace Force. This is noble indeed. We write to request another option in keeping with your desire for peace. Maybe you are an MP and Prime Minister precisely for this option. 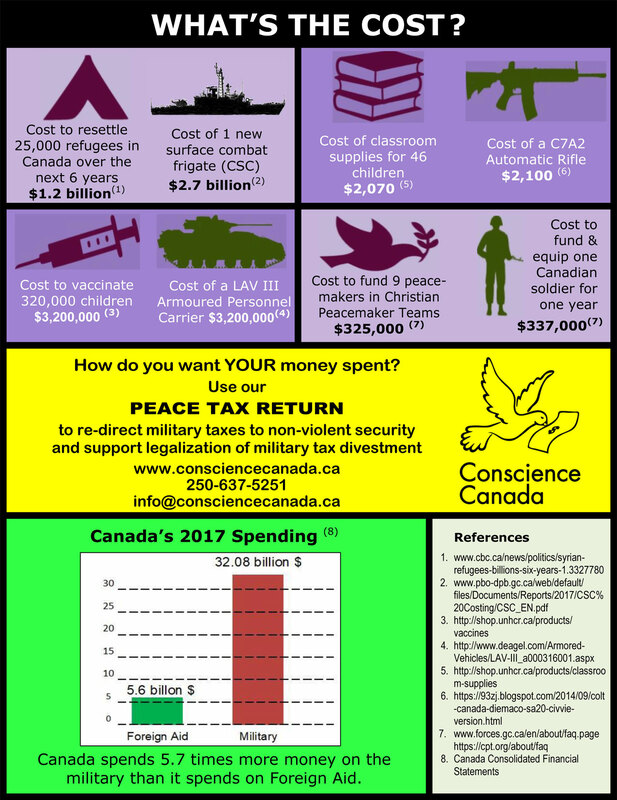 Use your conviction and influence and government to establish a Legal Peace Tax Fund so that Canadians like us can legally divert the military portion of our taxes to work for peace rather than preparing for war. If you would do so Canadians could choose this option and Canada would begin to show the rest of the world that we are serious about peace. Our children, our grandchildren and the children of the world will be in a better place. 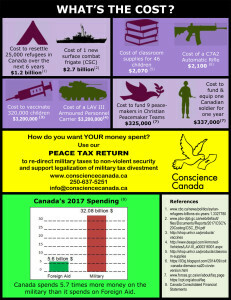 Motivated by a vision for a peaceful Canada, motivated by our conscience and faith, and desiring a better world for all children we have diverted the military portion of our taxes to Conscience Canada’s Peace Tax Fund for the past ten years. We have annually informed your office, the CRA, our MP and other government leaders of our actions and our reasons for doing so. All to no avail. We continue to be pursued by the CRA for tax dollars we have already paid. Do you support this action in light of Canada’s Charter of Rights and Freedoms? Our country has allowed for conscientious objection for over 200 years. Is this no longer an option at a time where technological warfare requires dollars more than bodies to fill boots and carry guns? We anticipate a reply. Please consider our request seriously. And please, not just another form letter. If you would like to remember more about war, the enormous costs, the deep-rooted causes, you might like to wear a white poppy (as well as a red one). You can get white poppies via http://www.peacepoppies.ca (which has instructions on how to make your own) and http://echecalaguerre.org/agir/campagne-2017-coquelicot-blanc/ . 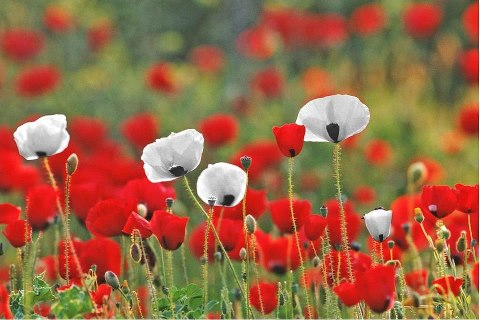 For more information, you might like to read this article: Personal and Public Remembrance: http://peacemagazine.org/archive/v29n4p27.htm or consult our “Remembrance Day Education kit” under “resources” on this website or visit the Peace Pledge Union site: http://ppu.org.uk . – that killing and participating in evil is an enormous sacrifice. Conversely, the sacrifices made in living in accordance with values of respect for life and nonviolence have value and meaning even in the face of short term setbacks and losses. 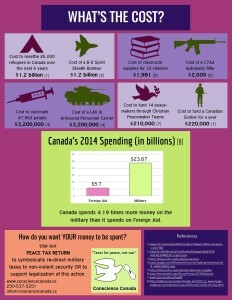 We grieve to see our country, Canada, so entwined in the military industrial complex. We devote between 6 and 10 per cent of our overall budget, the largest portion of the federal government’s discretionary program spending, to the military. And Canada’s commitment not to sell weapons to regimes or groups engaged in active warfare and human rights violations is a joke, especially with the approval of the sale of military vehicles to Saudi Arabia. According to Jane’s Defense Weekly, we are now the world’s second largest exporter of weapons to the MidEast! We are grateful that this government kept its promise to withdraw from the bombing in Iraq and Syria. But we are convinced that many of our policies and decisions are actually undermining our security. Defence Minister Sajjan spoke of the need to increase dialogue with Russia, to reduce tensions in the region, but Canada’s involvement in NATO’s encroachment on the buffer area between NATO countries and Russia will doubtless raise tensions, rather than lessen them. We need to shift away from a Defence posture based on trying to find and counter enemies to one that is based on Common Security (1) , on improving our capacity to work for peace and justice using the tools of nonviolence. This can best be accomplished by redirecting funding from weapons and the military towards a Department of Peace, which would include a Civilian Peace Service, capable of intervening nonviolently to protect people at home and abroad. 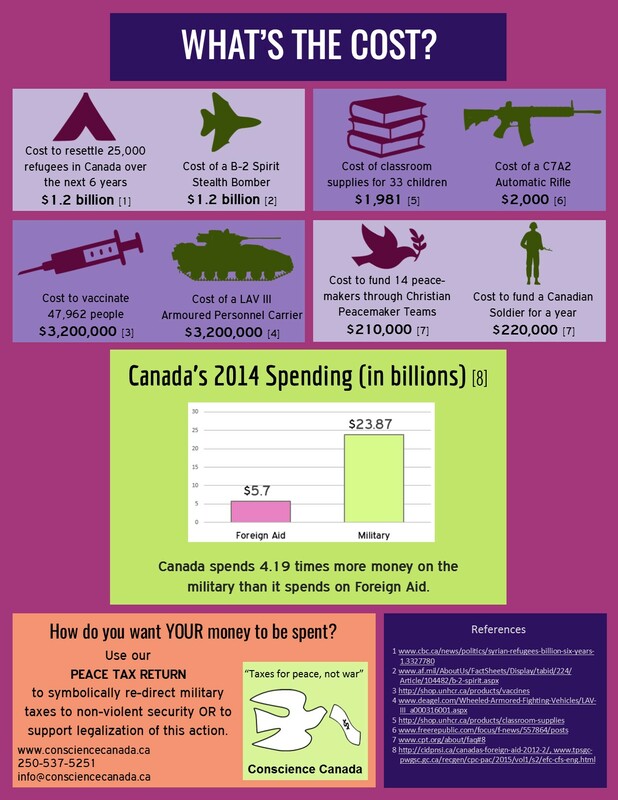 What could our money do if it was spent on humanitarian causes instead of the military? “We need to proactively engage ourselves and society in changing how we can deliver the message of peace and non-violent conflict resolution. Our thoughts create our actions. Without the mind shift that comes with routine small actions, our efforts will perish and failure will be inevitable. If left unchanged, these mental actions will soon turn into patterns and create a very powerful and destructive feedback loop. Social and political change can begin with small actions and can result in big changes in consciousness. That is the power of one. Peter’s words call to mind a line from the UNESCO constitution: “Since wars begin in the minds of men, it is in the minds of men that the defences of peace must be constructed.” The 4-slide presentation Peter prepared can serve as a valuable framework for presentations about the value of being a conscientious objector to military taxation. Conscience Canada board member Eric Unger urges our new Prime Minister to help create a culture of peace with justice. He quotes a great article by Matthew Behrens, which reminds us of the many ways we could work nonviolently to promote peace and justice in the Mid-East, including in regions controlled by ISIS or Da’esh. I’m sure that every Canadian who writes to you fervently hopes that their brief notes will influence you in some way. As citizens write to encourage and congratulate you, to implore and beseech you, or to scold and criticize you, they want to make a difference. This writer is no different. I encourage you to do your honourable best as you become familiar with the responsibilities you have accepted on the national and international stage. By now, you are more keenly aware of the consequences of all the promises and assurances you made prior to your election. I’m sure that this awareness will challenge you and your team in unexpected ways. As I’ve mentioned before, Canada appears to be ready to adjust the course, rather than stay the course and we are grateful for new opportunities to show the world that the reins which steer us are now taking us along new (or perhaps old) paths. I implore you to continue along a path that removes Canada from the spheres of violence in which the previous government was determined to insert us in order to convert us into a warrior nation. I’m not sure what you believe, but I believe that this world already has far too many warrior nations, every one of which exists in servitude to the bloody merchants of violence, the military industries who reap breath-taking personal profits as they destroy the very planet that gives them breath. In your fight (our fight, really) against the forces of chaos and destruction, have the courage to resist the voices that tell you that peace will come only through weapons of violence. This is completely illogical and unwise. Equally unwise is the long established tradition of training foreign militaries in the use of such weapons. I am fully convinced that if we could trace the personal journey into violence of every single perpetrator in the Taliban, Al Qaida, and Da’esh, we’d find a pretty direct, and perhaps even long-standing, connection to a military trainer authorized by a foreign government. I look forward to the headlines in the local press saying that our bombers, and eventually all Canadian Forces members, have been brought back home from their destructive sorties overseas. I’d love for you to read it all (http://rabble.ca/columnists/2015/11/canadas-deluded-wars-november), but this is unlikely. Maybe you could have a staff member read it and paraphrase it for you; maybe even the person who reads this note and must decide what to do with it. Paris should be considered not just a climate summit but a peace conference. Conscience Canada was one of 35 organizations which signed on to this letter initiated by ClimateFast and Step Up, Canada. We recognize climate change as a real security threat which, if addressed meaningfully, would surely help bring humanity together to work towards the common goal of a livable future. Although every MP has already received a copy, your MP will surely be more attentive if you send it yourself, and ask what he or she is doing to make sure Canada’s role at COP21 is constructive. This article, by Naomi Klein and Jason Box explains how the Paris climate summit is very much related to the peace agenda: http://www.newyorker.com/news/news-desk/why-a-climate-deal-is-the-best-hope-for-peace. Congratulations on forming the new Canadian government. We look forward to working with you to make Canadians proud of our country’s response to climate change. There is no time to waste before the 2015 Conference of the Parties to the U.N. Framework Convention on Climate Change (COP21) starting November 30 in Paris. Canada needs to go to Paris with a strong position and the federal government must take the lead. Canada must bring a new science-based emission reduction target to COP21 with the goal of achieving a universal, legally binding climate agreement that keeps global average temperature rise below two degrees Celsius. This would replace the previous government’s Intended Nationally Determined Contribution (INDC), which would result in 2030 emissions levels 6% higher than 1990. For Canada to do its fair share, we must cut carbon pollution nationally by at least one third by 2025 (35% below 2005). – Increases our pre-2020 ambition and actions, creating a carbon reduction target higher than the inadequate 17% below 2005 levels by 2020 set by the Conservative government. – Supports the inclusion of the goal to reach 100% renewable energy by 2050 within the Paris agreement. – Promises to enshrine our emissions reduction targets in law. – Invest in a national renewable energy plan at a scale that will secure a low-carbon future. Significant progress can be achieved by collaborating with the provinces, local governments, Inuit, Metis and First Nations, civil society and other concerned citizens to reach these goals. The Paris COP21 agreement presents an enormous opportunity for Canada to chart a path towards a more prosperous, equitable and sustainable future. We are counting on the Government of Canada to step up to its responsibilities as a member of the international community, and represent the true interests of Canadians and future generations on the international stage. As the October 2015 election dust settles and many new MPs are setting priorities for their role in parliament, now is a great time to meet with your MP and discuss their support of conscientious objection to military taxation! First, if you don’t know who is representing you in parliament, find your local MP using your postal code. Then ask around and see if you can get any other friends, co-workers, family, or acquaintances to go along with you. The more the merrier! Contact your MP directly to arrange a meeting, and bring a copy of at least a few of the items from our “Lobbying” page. In particular, you might want to bring a copy of our pamphlet and the report on Nonviolent Alternatives to Canadian Defense and Security. You can print them off from the website or Conscience Canada can mail some copies directly to you, just contact us and let us know! When you’re chatting, ask if they would be interested in promoting a private members’ bill to enable conscientious objectors to redirect the military portion of their taxes towards nonviolent peace and security-building programs. If they were to say “yes” that would be amazing, but if they say “no”, you can ask if they know of any colleagues who are concerned about the escalating cost of military expenditures and the problems associated with military procurement. After you’ve met with them, let us know how it went! We’d love to hear from you. We can be contacted at info@consciencecanada.ca. or janslakov at shaw.ca. PS Since our film has been removed from Youtube, if you would like a DVD copy, we still have some. Again, just get in touch if you would like us to send you a copy. Once again I write in support of a legal peace tax fund. It could be so easily implemented by your majority government. It could allow for the development of a desperately needed new vision for peace in our country and our world. For thousands of years governments and militaries have pursued the erroneous belief that one more war, one more bombing mission, one more act of violence and destruction will make their country and our world a safer place. And every time we go down this path of violence we become more fearful, we feel less safe, and we are detested and hated by those we choose to define as the enemy. And so the cycle continues……..